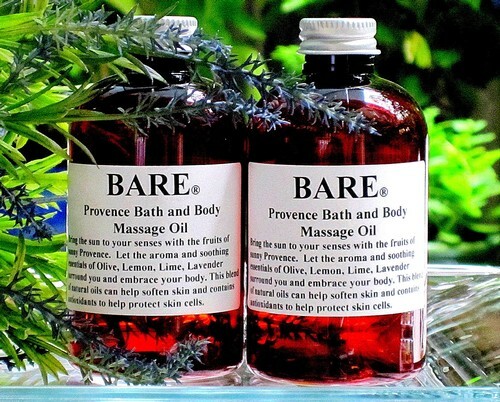 BARE "ABOUT FACE" (PROVENCE) Massage & Bath Oil provides complete rejuvenation of the skin by lifting the features and redefining facial contours with precision, smoothing wrinkles and providing intensive action to visibly firm the skin and ensuring the skin retains its youthful properties for a longer period of time. Application of the product restores freshness, brightness and radiance to the face and meets the needs of even the most demanding skin by providing immediate comfort and well-being. This is a luxurious oil that unites pleasure with performance. Bring the sun to your senses with the fruits of sunny Provence. Let the aroma and soothing essentials of Olive, Lemon, Lime, Lavender surround and embrace you. Soybean Oil , Sunflower Oil , Grapeseed Oil & Rice Bran Oil, Olive Oil, Lemon Oil, Lime Oil, Lavender Oil, Natural Vitamin E.